In many Edwardian houses, windows were larger than those of preceding eras because large glass panes were cheaper. 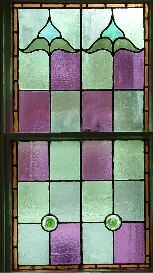 Stained glass was sometimes used, particularly for the upper lights in casement windows. However, particularly in Tudorbethan houses, small porch and inglenook windows were sometimes added. Greater use was made of casement windows, with leaded lights, sometimes also stained.